St Benedict’s opened in January 1962 and was staffed by Sisters Cabrini and Anne Mary of the Sisters of St Joseph, Lochinvar. Over sixty students were housed in wooden buildings transported to the present Edgeworth site from the Greta Migrant Camp. When a fifth hut arrived it was used as the convent. The original school and convent was officially opened and blessed by the Bishop of Maitland Dr. J.J. Toohey in January 1964. Father Bernard Kennedy, Parish Priest, was also in attendance. By the late 1980’s, it became necessary to build new facilities to accommodate increasing enrolments. A new administration block and two classrooms were built by Fr Peter Rees and blessed and opened by Father Kennedy in 1987, the school’s Silver Jubilee. A further two classrooms and modern canteen facilities were blessed and opened by the then Parish Priest, Father Bob Searle, in 1994. In 1997 the old Kindergarten/canteen building was destroyed by fire and was replaced by a new parish building. The building housed a caretaker and provided a valuable Out Of School Hours (OOSH) Centre. The St Benedict’s School area is one of rapid population growth. In 2007 six new classrooms and a new library were built. In addition, the school’s covered outdoor learning area (COLA) was extended and the administration block was refurbished. The building project was blessed and opened by Father Peter Rees, who had returned to the Parish. 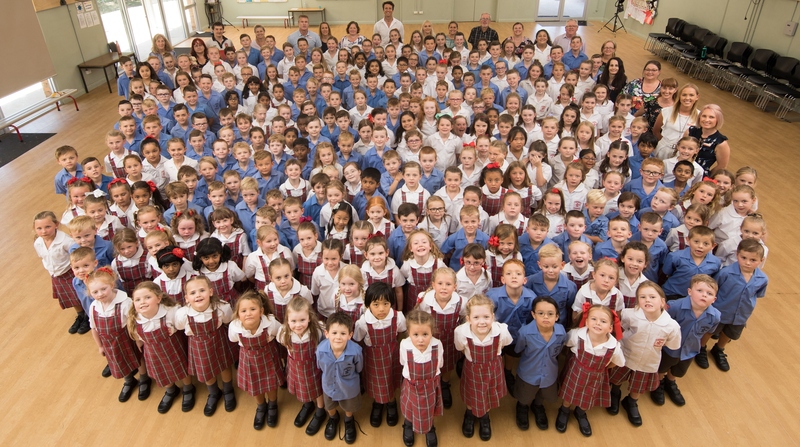 In 2011 two more classrooms and a new hall, a much needed facility for the school community, were completed. The new buildings were officially opened and blessed by Father Peter Rees. In 2012 the school celebrated its Golden Jubilee. There are currently 250 children enrolled.